This happens to me all the time. I use Pear Note to record a meeting, then leave the meeting without remembering to hit stop. A few hours later, I realize that I’ve been recording ever since then. Sometimes I’ve had private conversations that I really don’t want recorded, other times it’s just hours of silence. Early in developing Pear Note I realized this would be a problem. So, I made a solution. Pear Note allows you to crop recordings (look under the Edit menu). Just play up to the point you want to be the end of the recording (or drag the slider) and select “Crop Recording From Here”. Save your document and the excess recording is no more. Pear Note documents represent a single note, as opposed to a complete notebook like some other programs. I much prefer this for a number of reasons. It makes it easy to give a copy of a note to someone else, and you don’t end up with giant, unmanageable documents. With a good search capability, it can be just as easy to find notes that aren’t a part of notebooks as notes that are. But there’s one thing that’s always bothered me about having a single note per document file. I get really annoyed at having to continually pick a file name and folder to save the note. With Pear Note’s search feature, I can throw my notes anywhere and name them just about anything, so I really wanted a way to avoid thinking of a name and folder when saving. So, I created one. I may end up being the only person on the planet to use it, but I think it’s pretty cool. 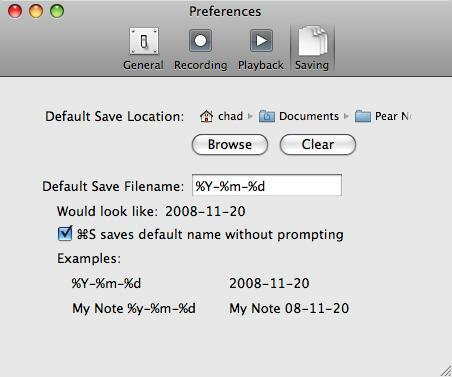 If you look under Saving in Pear Note’s preferences, you’ll see settings for a default save location, default save filename, and whether you want ⌘S to save to those defaults without prompting. Together, these three mean that you can avoid ever picking a file name again (of course, you can always choose one by using Save As… instead of Save). Believe it or not, I don’t plan for every post here to be about Pear Note. Some will be about my opinions of things, and some, like today’s, will be about developer topics. So, if you’re not a software developer, you probably won’t get too much out of this post. Pear Note uses QuickTime for recording and playback of audio/video. I recently ran into a problem that drove me crazy for some time, so I thought I’d share what I discovered here for other developers to learn from. One of the most common suggestions given to me when I showed people early versions of Pear Note was to add a library. Lots of similar apps have a library, which allows you to organize your documents, perhaps file them into groups or folders, and feel organized. This works somewhat well in some apps, but I’m really not a fan of it. I find I have 2 problems with libraries or similar organizational mechanisms. The first is that I never take the time to organize my documents well. Perhaps you’re more disciplined than me, but I end up with a catch-all folder that really does catch all. The second problem is that even when I do take the time to organize my documents, I still can’t find them 6 months later when I need them. Fortunately, organizing your data is not the only way. Search technologies have gotten so good that it’s not even outrageous to throw all your files in a single folder and rely solely on search to find them. While many of us have not quite gone that far yet, desktop search technologies like Spotlight, Quicksilver, or Google Desktop have completely changed the workflow of most Mac users. I use Spotlight constantly because it’s always faster than hunting through my Documents folder. I believe app developers should start to recognize this and create workflows to support it. So, with Pear Note I rejected having a library, and instead gave you very easy access to search. The search is actually powered by Spotlight, so I’m relying on minds much greater than my own to make Pear Note’s search great. I hope to make it even better in coming versions, but I already find it much more useful than manual organization in a library full of folders. I hope you do too.